The story of Death Note revolves around a high school student called Yagami Light. His life changed when he saw a supernatural notebook that fell from the sky. He picked it up and ridiculed it because he thought it was just a joke but took it anyway. He discovers that the owner of the notebook is not human but a Shinigami; A Death God. 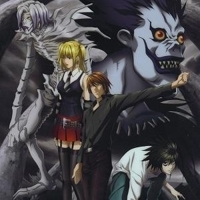 The Shinigami is known as Ryuk, whose appearance is very inhumane, very slim and tall and has long limbs. He also has pointy hair and has large yellow eyes with red irises and sharp teeth. 19280 users rated Death Note [TV].